Now, some 118 years since the first train steamed the 110 international miles from Skagway, Alaska, to Whitehorse, Yukon, the White Knight looming out of the mists of Taiya Inlet assumes the form of a gleaming cruise ship. Carnival Corporation, the world’s dominant operator of state-of-the-art vacation ships, is now the unlikely minority owner of the geriatric, narrow-gauge railway, running steeply uphill from U.S. tidewater to Canadian Taiga. Equally surprising, Carnival’s majority partner in the acquisition of this authentically antique railroad—whose active locomotive roster includes two original-owner steam locomotives—is a consortium including one of North America’s largest operator of rail yard container cranes. 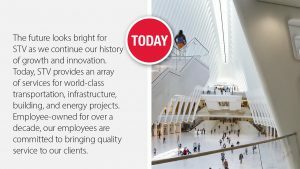 The very modern Rail Management Services of Seattle, Wash., is now a key partner in Klondike Management Services, the new entity that unites all WP&YR rail and port assets management. RMS President John J. Gray is leading an aggressive capital expenditure program that includes a new trackage in the high rock of the Alaska Range; an entirely new locomotive type to match the line’s torturous twists, turns and gradients; and a fresh set of running gear for a septuagenarian steamer. Never in its up-and-down history has the White Pass & Yukon Route seemed to be so secure. It survived the bust of gold mining, just as the line opened in 1900. It endured a World War II takeover by the U.S. Army, which pressed Rio Grande 2-8-2s (still extant on the Durango & Silverton) into hauling construction material for the Alaska Highway. After the war, with the now-renowned Mikados back home in Colorado, the narrow-gauge line eked out a living until 1982, when lead and zinc mining dwindled, and a new, all-weather highway was opened between Skagway and Whitehorse. Meanwhile, far away in the Caribbean Sea, island anchorages were over-crowding with soft-adventure travelers. In a quest for fresh destinations, cruise operators discovered the wartime deep draught docks of Skagway, at the cul-de-sac of a long, spectacular fjord. But aside from Skagway’s Gold Rush era saloons and its poignant rainforest cemetery of fallen Stampeders, there just wasn’t much for cruise passengers to see, in a town whose permanent population dips below 1,000. At the urging of the cruise lines, WP&YR tentatively re-opened part of the line in 1988 to haul ship passengers the first 21 dizzying miles up to the U.S./Canada international border at White Pass. The cruise business proved to be lucrative, and in 2017, after 20 years of stewardship by Toronto-based golf resort operator TWC Enterprises, the railway derived $60 million in operating income from some 430,000 passengers, during the four-month cruise season. While the owners did their best to maintain the line and its aging rolling stock, it became apparent that its arthritic fleet of steam and diesel locomotives simply could not match the projected growth in Alaska cruise demand from huge new ships being built expressly for the Skagway trade. Already, thousands were being left at the dock as WP&YR had to refuse disappointed cruise passengers who had not secured a reservation. 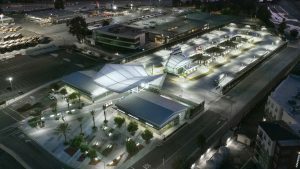 To ensure the future and enhance the capacity of one of its prime Alaska attractions, in mid-summer 2018, Carnival Cruises led the consortium of new owners who purchased the railway and its port operations for $290 million. Carnival is a minority stakeholder in the combined business, with the majority ownership group led by Survey Point Holdings, an Alaska-based transportation company that was already managing Skagway’s dock scheduling and nudging the ships pier-side with its fleet of tugboats. 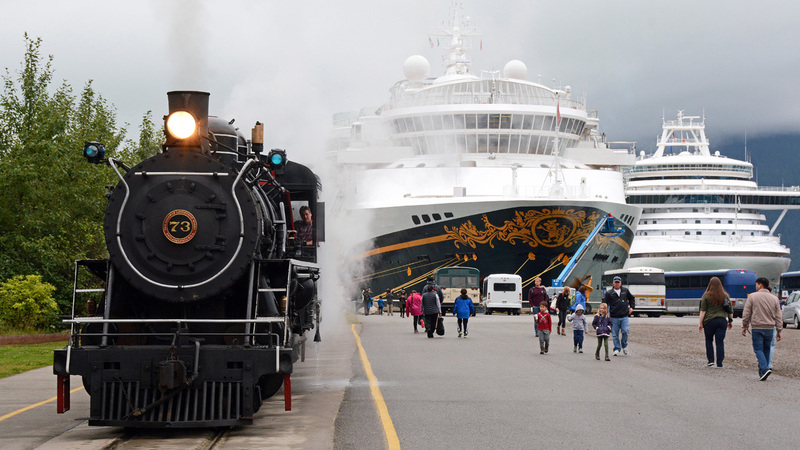 Summer mornings at Skagway are a spectacle of marine and rail interconnection. In a cluster around 8:00 a.m., four huge cruise ships tie up to separate berths where WP&YR trains are waiting. Nearly half of the season’s one million ship passengers board the trains for the three-hour round trip. The four 12-car trains leave with just 10 minutes headway between them, and bunch again upon arrival at the cramped White Pass rail yard, high atop the Continental Divide. There, in an awkward and time-consuming shuffle, the locomotives are run around their trains for the descent back to Skagway. By 5:00 p.m., the big ships and their passengers are gone, working their way back through Taiya Inlet toward the open ocean. Dynamite blasting in the high rock at White Pass signaled the new owners’ first act to increase peak passenger capacity. A turning loop and a pair of passing sidings between the summit and Skagway will allow WP&YR to increase train lengths from 12 to 16 cars, and avoid the time-consuming locomotive runarounds. WP&YR’s fleet of 81 active passenger cars have a convincing 19th century look, with red clerestory roofs, leaf springs and open platforms. But the short, steel cars glide on roller-bearing trucks over welded rail. Four of the vintage-looking cars are brand-new builds by Hamilton Manufacturing in Sedro-Wooley, Wash. 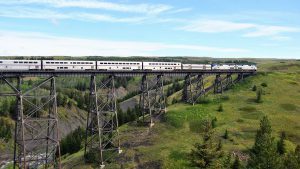 In addition, Hamilton is refurbishing and painting another 10 cars this winter while another 10 are being freshened by Cobalt Construction in Whitehorse, after being trucked from the end-of-operations track at Carcross, Yukon Territory. Eight authentic wooden cars from the 1890s also survive in the WP&YR yards. One is being restored to evaluate whether the entire fleet can be restored for steam excursions. To haul its fleet up the 3.9% grades to White Pass, WP&YR relies on a roster of tired diesels. The double-heading mainstay power consists of ten “shovel-nose” GE boxcabs, built in the 1950s and repowered since with gensets. Nine snub-nose Alco locomotives acquired for ore hauling in the 1960s provide backup. The smoky Alcos are low-power, high-maintenance units, considerably past their best-by date, and are less reliable than the older GE boxcabs. Just to get through next season, the railway barged three of the GE boxcabs to Washington for upgrading of wiring, plumbing, control software and trucks. With a substantial but undisclosed capital injection by its consortium of new owners, WP&YR is shopping for a new fleet of locomotives—not so easy with fewer than 36 inches of latitude between wheels. Only one traction motor can be made to fit: the GE 764, with just 375 hp at the rail surface. 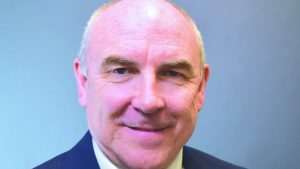 That, explains John Gray, makes for some difficult metrics at the drawbar: “To haul a 16-car train up a 3.9% grade at 18 mph, we need eight traction motors. Conventional designs would mean a minimum of two locomotives, each with four powered axles, or two with six powered axles. While the current roster of locomotives must return to the shop every three or four days to keep running, the new fleet will be expected to operate reliably on 90-day maintenance cycles, virtually the length of the annual operating season from late May to early September. The prospect of seeing modern narrow-gauge locomotives motoring up stiff mountain grades would set any diesel-era railfan to hyperventilating, even without the most spectacular scenery a cruise ticket can buy. But that would have been largely negated had the new owners succumbed to the temptation of converting the three-foot-gauge line to standard gauge and the attendant access to vast quantities of cheap redundant motive power. Fortunately, Carnival appreciated that the cachet of Gold Rush narrow-gauge railroading is essential to the WP&YR’s tourism allure. “We need to conserve the historical nature of the railway,” Gray says. The big motive power attraction, of course, will remain WP&YR’s exceptionally elegant steam locomotive, No. 73, a 2-8-2 that was built for WP&YR in 1947 and was the last domestic steamer built by Baldwin Locomotive Works in Philadelphia. That locomotive was withdrawn from service in 1964 and placed on outdoor display at the Bennett BC station. Recovered and restored in 1979 to stimulate tourism traffic in the waning years of ore haulage, 73 is once again in pieces, spread across Washington State at machine shops and boilermakers. The completely refurbished tender awaits at Hamilton Manufacturing while the boiler is rebuilt by Toutle Boiler Works. Meanwhile, a new set of running gear is being precision-machined by an aircraft parts manufacturer. The engine is to be reassembled and tested by Hamilton this winter and shipped back to Skagway to enter service in June. The plan is to confine the steamer to excursion extras, but 73 will be kept under steam all summer long to greet docking ships with its throaty whistle. It will sometimes be joined on the docks by No. 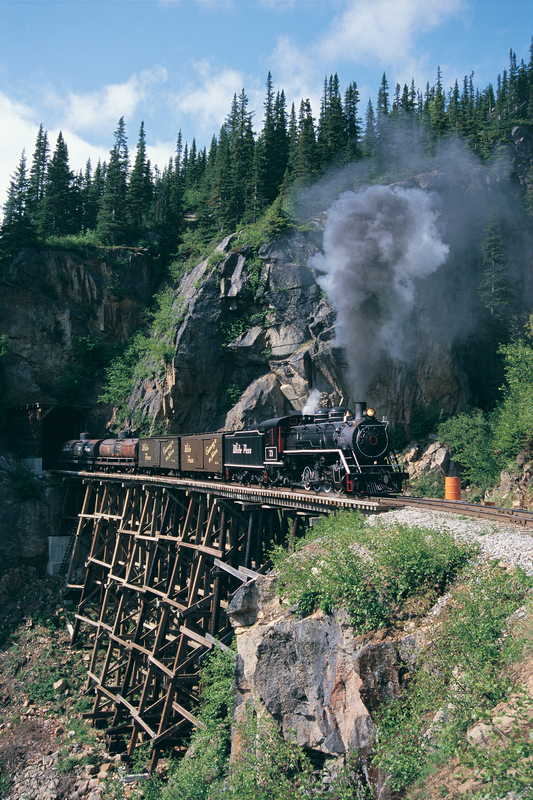 69, a 2-8-0 acquired new way back in 1908 from Baldwin and being rebuilt by WP&YR’s own steam shop in Skagway. However, the vision of double-headed, narrow-gauge steam locomotives once again shoving WP&YR’s steam-powered, 1898 rotary plow across snow-covered cliff edges will be hard to confine to railfan fantasy. WP&YR owns two other non-operational steamers. Mogul (2-6-0) No. 52, built in 1881 and acquired by WP&YR in 1898, was damaged by rust and fire since retirement in 1936 and is now being considered for restoration. The 1883 0-6-0T No. 2 named The Duchess ignominiously ended its operating life as a trash burner from 1920 to 1931, but has been cosmetically restored for display. 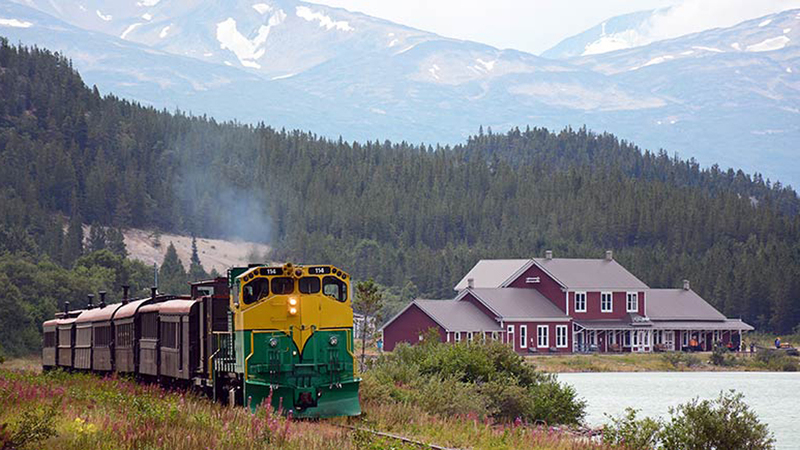 In addition to the cruise shuttles to White Pass, WP&YR operates a single train daily the 67 miles to Carcross in Canada. No trains have run all the way to Whitehorse since 1982, and the line is overgrown with saplings and interrupted by five small washouts. But the right-of-way remains intact and under railway ownership. WP&YR’s new owners intend to stabilize the unused trackage and maintain its charter to eventually run all the Whitehorse, Yukon Territory’s only city. 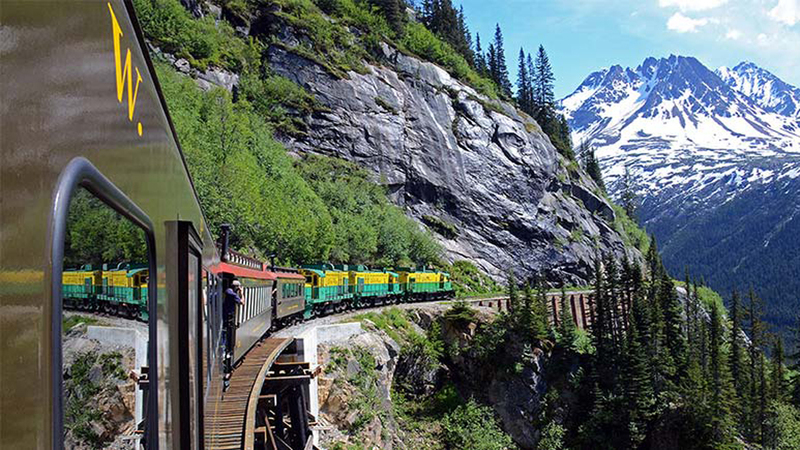 Under its new owners, what was not long ago a historical curiosity of the Klondike Gold Rush seems destined to become an enduring, living monument to the improbable resilience of narrow-gauge railroading in the most scenically enchanting corner of North America.